i am going off to college later this year and was planning on taking my birds with me, but my dad doesn't want me to get an apartment in my first year; i'll have to wait at least another year (so larry would be staying home while i'm at school, im not sure if he'd really miss me, he likes my dad more, ironically). i have applied to one very pet friendly university that would allow me to take him, but if i'm not supposed to let my boyfriend dictate my school, i probably shouldn't let my bird dictate it either haha. i have tried to train him to not make noise by rewarding him when he is behaved, but its not working as effectively as i would like it to. i was wondering if anyone had any suggestions as to what would make him a little quieter? i was thinking about buying more toys for him; he has a large wood and rope toy, another wood toy, a plastic bowl toy, and a "boing" rope currently. so, if i could also have some ideas for things to keep him busy, toys, or foraging activities, i'd really appreciate it! Sounds like you need to relocate with your birds. When you are in your parents domain, they call the shots. You are always at your landlords mercy. It is heartbreaking to me to see someone put in this situation. FYI, expect Larry to dictate how some of your life gets spent if you want a companion. You do realize you will probably have Larry for over 20 years? haha yes i know that he will dictate some of my life (e.g. where and how i live) that's a given when owning any pet, i was just making a joke. 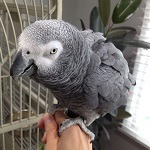 and yes i do know that i will have larry for a very very long time, i did happen to research african greys before i picked him, i didn't expect him to grow old and die within a few years. i think that i will definitely relocate with my animals eventually. i qualify to have emotional support animals (ESA). my parents like my two other pets and actually want to keep them while i am away. so there is a possibility that i can register larry as my ESA and take him with me to most colleges/apartments. however, i do need to figure out ways to curb his noise. i don't necessarily want him quiet (i definitely don't actually), i just don't want him to be incessantly disruptive to people living near me. Interact with him as much as you can and see if he gets the routine that the more quiet he keeps it the more you interact. They are going to be noisy and bitchy just like anyone will tell you, but be glad you don't have a cockatoo unless you want another appendage. An appendage that can be heard for 1/4 mile! Most of the time he gets it as I have boings for him to roost on in every room. I removed all my carpet. He yells for food or bangs his bowls around. Maybe you could get your parents to understand what a wonderful thing an AG is. Get a copy of "Alex and Me" for them. i'll definitely try that! i honestly think that larry may be calling for my dad's attention and since my dad doesn't really like him, he's not giving larry any attention, so its sort of like a catch-22! i'll definitely talk to him about it and pick up a copy of that book! Tell your dad he doesn't know what he is missing. He will after he reads that book. I feel like my two aren't so noisy, but in reality, I've just gotten used to them. Visitors who stay with us often comment on the noise, but our family has tuned it out. Not sure how to curb the noise during the day. At night, I keep my two covered and they don't make any noise till the morning. During the daytime, they often keep up with the noise level of the family. When I was in an apartment, my neighbors complained about the noise. I introduced myself and tried to make friends with them, and that helped. Then I put the birds on the patio during the daytime. The patio faced the front entrance, and the birds quickly learned to greet people going in and out of the apartment. After a few weeks, people began talking back to them and then I was no longer worried about getting kicked out. Most of the time, Chyloe will talk or sit quietly. However, she has times where she will emit a loud squeak which drives my husband crazy because it hurts his ears. He keeps threatening her. She still does the squeak but now adds, "Hey" in my husband's voice.